July 16, 2015 -- Throughout her career, Tendai Chitewere has, as an African-American woman, felt unfairly judged and unwelcome in certain situations. "I'm often, even today, in places where people assume I don't belong or I can't do certain basic things that my peers are automatically assumed to be competent in," said Chitewere, an associate professor of geography and environment at SF State. "You work on developing a thick skin, but it does affect you, and it accumulates." Now Chitewere is helping a new generation of students overcome this challenge. Student Natalie Warren, from left, Professor of Biology Leticia Marquez-Magana and student Joi Lee work in the Health Equity Research (HER) Lab at SF State. This summer, 11 SF State undergraduates are participating in intense training labs as part of SF BUILD ("Building Infrastructure Leading to Diversity"). Funded by a $17.04 million grant from the National Institutes of Health, the program aims to enhance diversity in biomedical research fields. 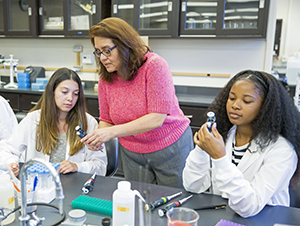 Over the summer, the students are participating in three SF State labs covering different aspects of community-based research, followed by four weeks of clinical research training at University of California, San Francisco. For the next two years of their academic career, the students will work closely with a faculty member on a research project with a local connection that is personally relevant to them. "The idea is to get involved in a project as meaningful contributors and end up with a publication or presenting at a conference," said Associate Professor of Chemistry Teaster Baird, one of the scholars' faculty mentors. "Having that experience is going to be key to getting into grad school in the first place, and then once they get there, they'll have that higher level of confidence in their research because they will have done it before." SF BUILD also seeks to reduce susceptibility to "stereotype threat," which occurs when prejudices negatively affect an individual's performance, such as a woman underperforming in an all-male lab setting due both to her colleague's perceptions of her and her own internalized stereotypes about women in science. "Stereotype threat can discourage us from pursuing our goals, can make us doubt our abilities and make it hard for us to reach our full potential," Chitewere said. "Addressing stereotype threat can help us free ourselves to focus on our strengths." In addition, SF BUILD leaders will investigate student and faculty perceptions about barriers to recruitment and persistence of minority students in the sciences and develop methods to overcome these challenges. Their findings, the leaders hope, will allow them to develop best practices that can be implemented in classrooms at SF State and even disseminated nationally. The SF BUILD leaders hope the program will make the University's science training more effective for all students, Baird added. "Given the diverse population of students here, the potential for triggering stereotype threat is pretty high," Baird said. "I'm sure some faculty aren’t really aware of stereotype threat and don't know they can unintentionally have an impact -- and not a positive one -- on their students. There are ways to mitigate it, but you have to be aware of it first." Both Baird and Chitewere said they find fulfillment in mentoring the BUILD scholars because they themselves persevered in their studies in part because of support from professors. "I had professors who reached out and said, 'You're not going to give up. We're going to get through this together,'" Chitewere said. "They showed me that I wasn't invisible, my work wasn't invisible, I had value. Without that it would have been much harder." Her work with SF BUILD, Chitewere said, is the best way she can imagine giving back to the professors who made an impact on her life. "I told the SF BUILD scholars that this is my way of thanking those who helped me to get where I am," Chitewere said. "These students can then pay it forward by supporting the next generation, and we'll keep that going. That's a powerful idea." In the meantime, Baird said, the students can support each other. "We want to build a community so that even when the students do go their separate ways, they don't feel isolated," he explained. "They'll always have each other to fall back on." Indeed, psychology major Shane Colombo, one of the BUILD scholars, envisions the scholars' connection lasting far into the future. "We're forming a really close bond, and because we're from different disciplines we might be able to collaborate on our research later on," he said. "They have a lot to teach me and I have a lot to teach them." Just a few weeks into the program, based on the influence of his peers and their lab work, Colombo has already adjusted his career goals -- rather than focusing on clinical work with individual patients, he now wants to do more broadly applicable research on psychological stressors faced by people from disadvantaged socio-economic backgrounds. "For a lot of us, it's the first time we're actually learning how we can help communities answer questions that aren't currently being addressed," Colombo said. "That's something I want to do now that I am seeing the bridge between social equity and biomedical research." Colombo said his life experience, particularly being a cancer survivor, gives him a unique -- and valuable -- ability to pinpoint research needs that are not being addressed. "If we expect to find scientific solutions for health outcomes that are relevant for all communities, we need to start by having those with completely different perspectives begin asking the research questions," Colombo said. "I feel like I can make a difference through my perspective, but that in itself isn't enough. SF BUILD is giving me the tools to make that a reality." The principal investigators of SF BUILD are Professor of Biology Leticia Márquez-Magaña (lead), Professor of Psychology Avi Ben-Zeev, Associate Professor of Chemistry/Biochemistry Teaster Baird Jr., Associate Professor of Geography and Environment Tendai Chitewere, Professor of Biology Carmen Domingo, as well as Kirsten Bibbins-Domingo, professor of medicine and epidemiology at UCSF, its principal investigator for the project. To learn more about SF BUILD, visit sfbuild.sfsu.edu.